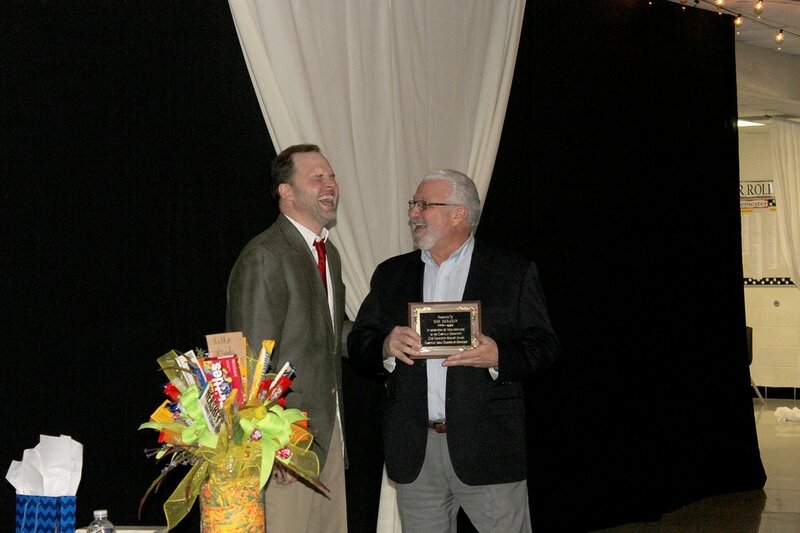 Outgoing Chamber president Wade Hermansen (left) shares a laugh with Mike McCracken (right) who was bestowed with the individual award for community service by the Cassville Area Chamber of Commerce. President Hermansen presented a beautification award to representatives of Roaring River Healthcare and Rehab for their greenhouse addition to their facility. Pictured above, left to right are Hermansen, Terri Desrochers and Melissa Inman. 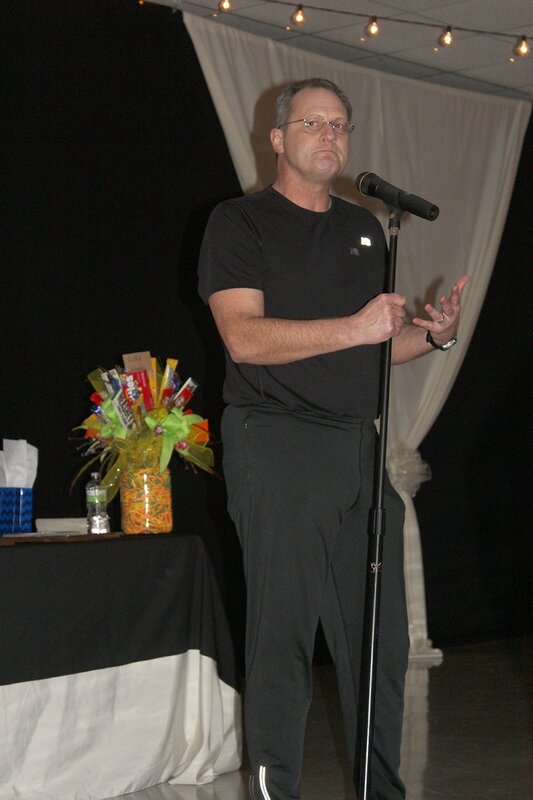 Comedian Kent Rader provided the Chamber banquet’s entertainment on Saturday night. The Cassville Area Chamber of Commerce hosted their annual banquet on Saturday, February 4, in the commons area of Cassville High School. The event, which serves as a social gathering as well as a ceremony to thank board members and present community awards, was well-attended with a large meal and entertainment by clean comedian Kent Rader. 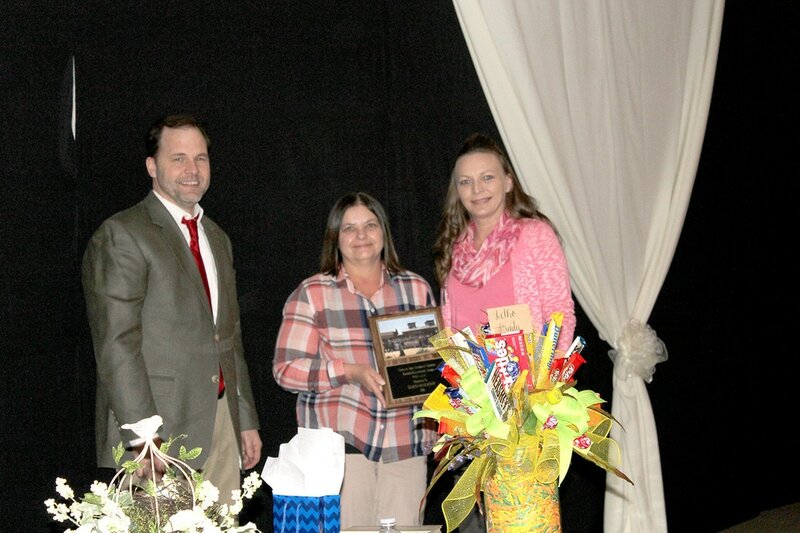 This year’s banquet offered up recognition to retiring board members, welcomed new board members and also recognized members of the community who had made a positive impact through service or business beautification in Cassville. Opening the banquet was outgoing board president Wade Hermansen with the invocation by pastor James Weaver. Angela Seymour presented to banquet attendees about the Chamber program Tomorrow’s Leaders Today, a Cassville High School collaboration where students learn about business and industry in the area. Retiring board members Gary Whyte, Stacy Runnels, Angela Seymour and Wade Hermansen were all thanked for the dedication to the board and given parting gifts. They also welcomed new members Devon Forsythe, Rick Ragsdale, Ryan Stockton and Laura Holycross. The main entertainment for the evening was selected and introduced by incoming board president Jeff Swadley, principal of Cassville High School. Entertainer Kent Rader provided comedy during the banquet, giving lots of laughs for those in attendance. Rader’s focus is on the importance of laughter in the workplace. Finally, Hermansen presented awards recognizing community members for their dedication and service to the area, making Cassville a better place to live. The first award of the evening went to Roaring River Healthcare and Rehab for beautification. The rehab facility recently completed an indoor greenhouse addition to their building, giving residents a place to work in the garden and relax. The addition was a huge improvement to the facility. Representatives from Roaring River Healthcare and Rehab who received the award were Terri Desrochers and Melissa Inman. The next beautification award was presented this year to a group instead of to a specific business. The beautification award went to the Cassville Main Street Association for their recent lighting project around the courthouse and along downtown Main Street. Accepting the award on behalf of the association was Carolyn Bishop, who spearheaded the project. Bishop spoke of the history of the group, including their DREAM Initiative, as well as future plans to do two new projects. Finally, Hermansen presented the final award, the individual recognition for a community member who has proved their dedication to community service. This year’s award went to Commerce Bank preisdent Mike McCracken who has spent decades serving the community through different boards and duties. This year’s banquet was catered by John Sullivan, hosted by the Cassville High School, decorated by Accents-N-Tents and guests were served by Cassville High School FCCLA members.